GOLDSWORTH Park Rangers rolled out the red carpet on Saturday to welcome England’s World Cup hero Sir Geoff Hurst to Wishbone Way. As the Head of McDonald’s community football programme, the 1966 Jules Rimet Trophy winner was the guest of honour at the latest edition of Rangers’ annual summer tournament, which saw around 1,600 youngsters aged as young as five join in the football fun over the two-day event. The only man to score a World Cup Final hat-trick, Sir Geoff was happy to oblige with some advice and autographs for the youngsters. He said: “It’s great to see all these young kids playing football and enjoying themselves. 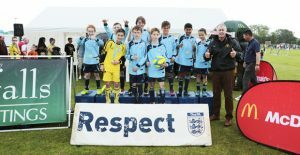 “It’s great what McDonald’s are doing for clubs like Goldsworth Park Rangers; with better equipment, coaching, facilities and, very importantly, better recognition for all the volunteers. As a big fan of female football, the Three Lions legend said the girls’ and women’s competitions at the tournament illustrated how far the game has come, even in his 14 years working as an ambassador. “It’s [the women’s game] an area that’s grown dramatically over the 14 years I’ve worked with the community programme. The two-day event was sponsored by Waterfalls Estate Agency and Chertsey Road’s McDonald’s.